TC Lee, the father of a Gunn High School student who died by suicide in 2015, spoke to a full crowd at First Christian Church in Palo Alto on Sunday about mental health and his own path of recovery from loss and grief. Lee described the role that parents and families, religion and awareness can play in helping a high-pressure community battle what he called an "invisible, non-physical" "enemy": mental illness. While schools or other institutions can make improvements to support youth struggling with mental-health issues, wellness should begin at home, Lee said. He urged parents to be aware, to express their feelings to their children and make them feel accepted at home. "Hug them. Say, 'I love you.' Right away. Today," he said. "The safe haven, the safe harbor," he added, "is the family." Parents should also praise their children "for who they are, not what you want them to be," Lee told the audience. Lee also lamented a lack of support and resources in the area for families in crisis, saying it took two weeks and going outside of the family's insurance network to get his son an appointment with a psychiatrist. This echoes other anecdotal stories shared over the past year-plus by Palo Alto teenagers and parents struggling to find quality and timely care in an impacted system. The American Academy of Child & Adolescent Psychiatry (AACAP) also recently released data showing that there is a severe shortage of child and adolescent psychiatrists across California. In Santa Clara County, there are a total of 87 child and adolescent psychiatrists -- a rate of about 20 mental-health professionals per 100,000 children, according to the AACAP. 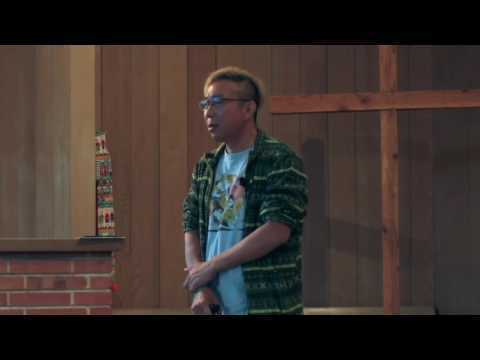 Lee, who gave a similar talk previously at First Christian Church to a group of Mandarin-speaking community members, also spoke passionately about the role that faith and religion has played in his own grieving process. He told the Weekly in a previous interview that he felt compelled to share his story to increase awareness about mental health. "We are all in this together," he said Sunday night. "We should work together, united ... to fight that enemy." VIDEO: To watch excerpts from the talk, click here. Any person who is feeling depressed, troubled or suicidal is urged to call 1-800-784-2433 to speak with a crisis counselor. People in Santa Clara County can also call 1-855-278-4204. Thank you for taking the time to videotape this talk and post the excerpts. I wasn't able to attend in person and found the father's words very moving. A heartbreaking story. What a great man to be able to share to help others. I'm so sorry for Mr. Lee, and all the other families who have gone through this. He speaks some very wise words. "Parents should also praise their children "for who they are, not what you want them to be," Lee told the audience." Praying that his message spreads. Thank you Mr. Lee for your words of wisdom. I'm so sorry for your loss. I hope your message spreads to the people who need it, so that kids are saved. As a biracial kid, I found that my Asian mother did NOT at all value any sort of creativity. I was artistic, a very good actor, and an excellent writer. I was, however, also good at math, but did not enjoy it. In high school (Monta Vista, btw), every time I would join an after school club or activity that had anything to do with art, acting, creative writing, or sports, she would call my counselor and tell her I had no permission to join. She would see to it that I could not attend, and got suspicious if I was 15 minutes late coming home (where have you BEEN? WHO with? For WHAT purpose? HOW could you?). Never once, until I was 19, did I ever have a birthday party. If I had a sleepover, it was my Asian cousins, not my American cousins. I had to start my piano practice at 6:00 a.m., before school, starting when I was six. After school it was tutoring or Mandarin lessons or piano lessons. If I had less than two hours of homework in middle school, my mom gave me MORE. It was that way in high school, too--and I went to a high pressure school. In fact, I was whipped with a belt when I failed to get into Stanford. My mom was so rigid, not even letting my father have a dog, or me a cat, that when I was 17 they split up. THAT was when I became suicidal...now there was no one to keep my mom off my back. The change came when I asked my dad if I could live with him, and he talked to his lawyer. The rest, as we say, is history. I got a year off from school, worked with a psychiatrist twice a week, went to a different school, a private one, and got into Boston College on deferred entrance. Thanks so much for sharing. I know teachers in the past have assumed my children have a Tiger Mom if they are concerned about their grade, not realizing it's mostly the immigrants who are Tiger Moms. However, I have met many immigrant Asians who are not Tigers, who immigrate here to avoid the extreme academic stress. Sure, they still want their children to work hard but they care about their mental health and opinions too. I feel like all of us Chinese are assumed to be Tiger Parents and it's upsetting. A Chinese immigrant teacher would tell me these awful stories (disapprovingly) about the Tiger Parents. One Gunn gal had to practice 6 hours of violin per day; another is woken up at 4AM to practice piano and study and must become a physician. I asked if he wants to become a physician and he doesn't. Others have scoffed at my son taking summer sports camps instead of academic camps. And I have read blogs on Tiger Cub adults having mental issues as a result of Tiger Parenting. It's very sad, and I want to remind people that there is a box in the counseling office at Paly for people to anonymously report names of students who are of concern. Majority of the schools, sports, theatre plays... in Bay Area are competitive among MOST races. Not just one particular one. Lets take a break and enjoy summer with your friends and family.